These photos were taken of the north side of London Road, Kingston on a sunny day in March 2015. Looking at the variety of buildings you can see remnants of Kingston’s past – in the physical structures, but also in the types of businesses (undertaker, garage, restaurant, offices) and even in the names of some of them, which have survived for longer than the 213 bus has been running. Using the Kelly’s Street Directories for Kingston editions of 1922, 1925, 1930, 1935, 1940, 1951, 1956, 1960, 1966 and 1971, and a variety of resources available in Kingston’s Local History Collection, the following is a collaged together history of London Road, no. 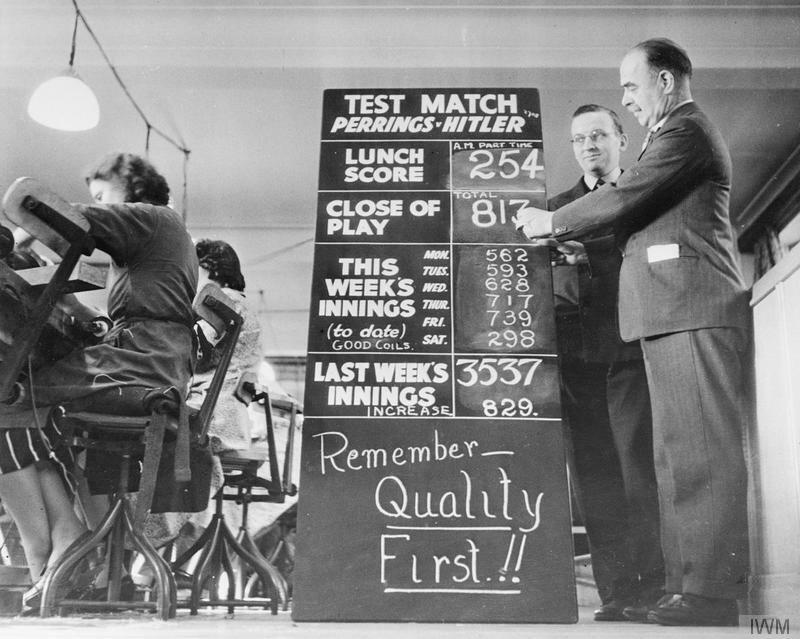 117 to 151 from 1921. It isn’t intended to be comprehensive, nor would such a history be possible to write – there is so much to tell even along this short section of road. Also called Walnut Tree House, Elmfield was previously Chapel Farm, on the estate of the Lovekyn Chapel, but it ceased as a working farm in 1737. The Chapel Farm included the main house of brick, stables, coach houses, barns, other outbuildings, a dove cote and 9 acres of land. Most of the house was rebuilt in 1754, and much of the surviving building is original including a fanlight over a first floor door, staircase and some fireplaces. In 1851 is was a school for girls, in 1861 it was The Elms, a private home. The site was briefly the home for the School for Physically Defective Children. This first opened in October 1905 at Church Road, then moved to Fairfield South in December 1912 and to the Elmfield site in March 1922 but had to vacate it in 1929 when Tiffin School moved there. Kingston Local History collection hass a souvenir pamphlet about the official opening of purpose built premises on Grange Road in 1931, describing the building which is now Bedelsford School. ‘Bricks and mortar may not be all that is required to make a school, but a dignified, well-designed structure may go a long way towards scholastic efficiency and the promotion of the right atmosphere’ letters page, Surrey Comet 2nd November 1929. Tiffin Boys School moved to the Elmfield site in 1929, to a new school building which including land purchase and furnishings cost Surrey County Council approximately £50,000 (land was £5,800 for 5 acres). It was officially opened on October 31st 1929 by Lord Ashcombe, Lord Lieutenant of Surrey, in the attendance of: the Mayor of Kingston, Bishop of Kingston, Chairman of Surrey County Council, Chairman of Maldens and Coombe Urban District and a whole load of other officials and prominent Kingstonians including Mr R H Turk (of Turks Steamers), Mr V Knapp (publisher of Comet) and Mr L H Bentall (of Bentalls). The Building comprised of 14 ‘light and airy’ classrooms, 5 science laboratories, an art room, a special room for geography, a library and ‘in the house which was being reconditioned’ [presumably Elmfield] a music room, dining rooms and a kitchen. It was designed to accommodate 600 boys. Reported in the Surrey Comet at the time, salaries amounted to £11,000 per year total. 130 boys entered examinations for a scholarship each year, of which 14 were awarded in 1929, and although 98% were ‘fit to enter a secondary school’, only 10% went on to accept a fee-paying place. In Kingston District in 1929, 1200 children were being education at Kingston Grammar and the Tiffin Schools; 250 were in Junior Technical Schools, 240 in Day Commercial School, and approximately 1750 taking evening classes at the Technical College. The Tiffin brothers were wealthy brewers in the 17th century who left a sum of £150 for the education of poor boys and apprentices, which in turn led to the establishment of the Tiffin Schools by Kingston Corporation for lower middle class children. The school opened in January 1880 with 36 boys and 46 girls at what is now St Joseph’s Catholic Primary School on the Fairfield. By the end of the 19th century, the school had 700 pupils and 1899 saw the girls vacate to premise on St James Road. In the 1918 Education Act, all children to be educated to 14; which increased demand for school places. In 1929 there were 486 pupils at Tiffin, and the Fairfield site didn’t have an assembly hall big enough to address the whole school, so it was quite a momentous occasion to move to their new home. The Queen Elizabeth Road building of 1929 now has lots of additions – South Building (1986), Chester Centre (1991), Sports Centre (1996), Dempsey Centre (2004). School now has over 1000 pupils. 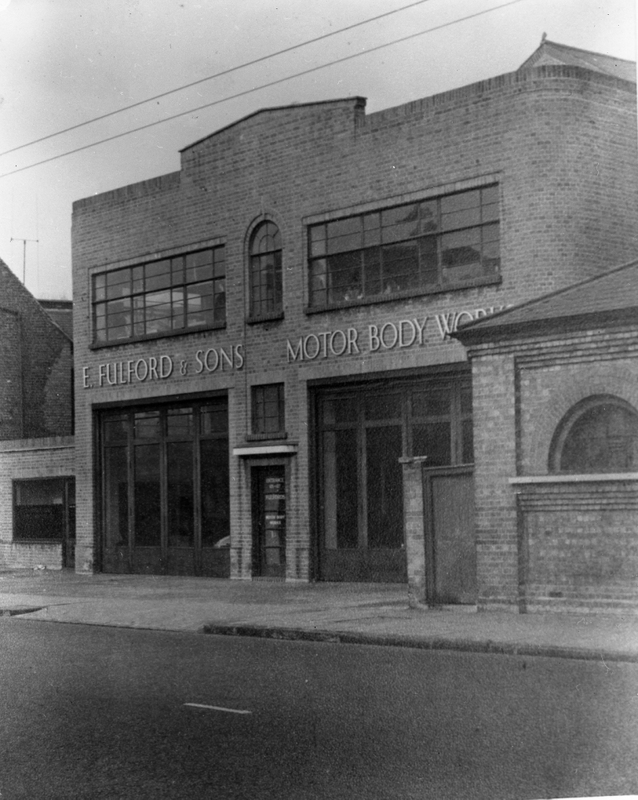 Fulfords of Kingston: Fulford Garage, described as a Coachworks in 1922, was established in 1877. In the Street directory of 1966, they are described as motor body repairers and collision refinishers. They are still in business today. London Transport Executive (Tramways) Sub-station was built in 1906 by Courtney and Fairbairn at a cost of £1669 to house three 500kW rotary converters and 10 200Ks transformers to power the borough’s tramways. 1921 and 1933 it was the dental surgery of Frank Bevan, but it lost its front garden during street widening and the windows of the basement were bricked up as the road was raised. Converted to shops in late 1930s, the frontage was restored in 1966, and interior restoration by Haslemere Estates completed in 1979. This was a complicated site, including the building, left – which still survives and was used by Hepworth Iron Co. Ltd. There was also a huge factory on the site, which housed at one time Micro Precision Products. In 1930, no.145 was home to the Surrey Group Anti-aircraft Searchlight Companies, Royal Engineers (TA) and 316th (Surrey) Anti-Aircraft Searchlight Company HQ. By 1938, Perring, John Ltd ‘complete house furnishers’ had a “bright modern store” there. Set up in 1892 by two brothers, John and William, with premises at Richmond and Paddington, the businesses expanded to Twickenham, Putney and Tooting and Harlesden and Willesden. By 1938, John’s chain had 20 branches and William’s had 13. Shops in Kingston, Sutton and Guildford converted in World War Two to factories led by volunteers producing 8.5million armature coils (electrical equipment for planes radios). Perrings had the most outworkers employed by a single organisation during the war effort. It was an all female staff, highly skilled, manipulating 450 miles of wire per day which was not much thicker than human hair under the directorship of Sir Ralph Perring. In 1992 the company still had premises at Eden Street and Head Quarters at Avenue House, Malden Road, Worcester Park, but they went into receivership in 1994. No.145a was Hickman and Bishop estate agents, also Nash and Thompson Ltd aka Archie Frazer Nash, sports car designer and manufacturer, inventors of the FN Gun Turret – an hydraulic powered machine gun turret dated 1929 and later fitted to Hawker airplanes. No.145b was McMurdo Instrument Co. Ltd electro-mechanical engineers and Mirco-Precision Products Ltd photographic Equipment Manufacturers. Their parent company, Celestion, started in Hampton Wick in 1924 as the Electrical Manufacturing and Plating Company. They built loud speakers – becoming Celestion Radio Co. and Celestion Ltd in 1927 manufacturing radios and gramophones. Production at their factory on the site was badly hit by the recession of the ‘30s, but from 1940 to 1945 the sole factory output was W-type loudspeakers for radios. Production moved to Thames Ditton in 1948. Micro Precision Products started in 1940/1 by Patrick de Laszlo – owner of Celestion Ltd. and McMurdo was a subsidiary. MPP was the selling agent for their products. Alfred James Dell was an instrumental figure in the company – involved in design, manufacture and financial management for almost the entirety of the company’s existence. McMurdo originally made petrol cigarette lighters from brass, moving on the photographic equipment such as enlarges, tripods and projectors. Eventually MPP duplicated German style camera manufacture of twin lens reflex. 300 employees at the London Road site, but they moved to 22 High Street, Kingston in 1961, and the business failed in 1982. Croner House is now there, the base of Wolters Kluwer UK tax and accountancy Products and Services. 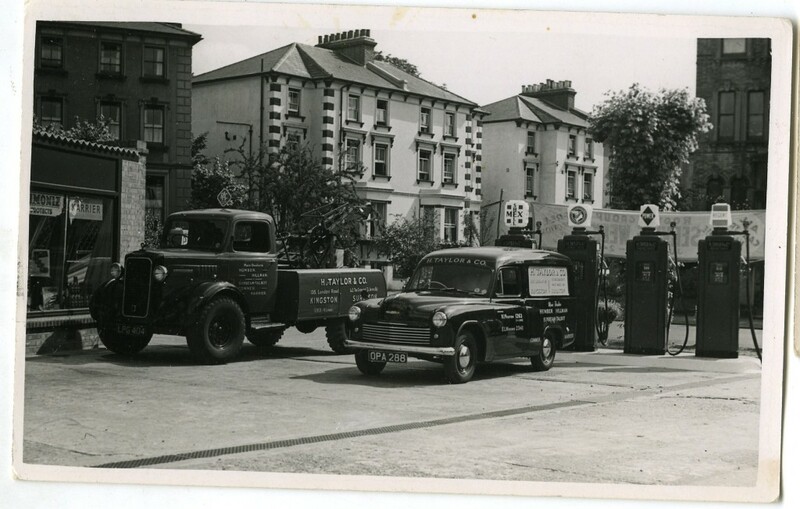 Sergeants James W, builders merchants, were founded in 1880 and moved in 1920 to London Road where they stayed until 1963, claiming to have invented the humble breeze block there. Now the site of Clarendon House which was built as Rawlplug House. 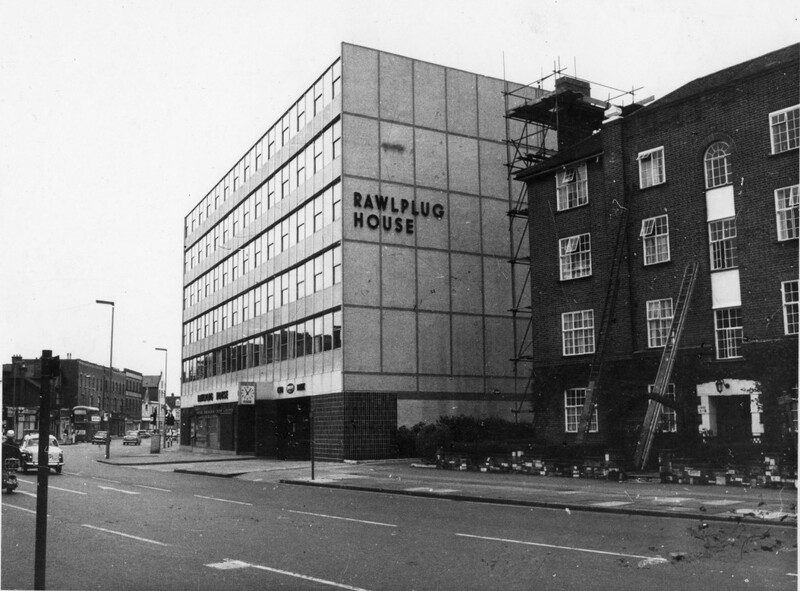 Rawlplug were originally plumbers who then became engineers and building contractors, and made their millions when they invented the Rawlplug – a small insert to fill a hole into which you want to screw, now common place in all our walls in the extruded plastic variety (if you’ve ever drilled into a crumbling wall you will have used a Rawlplug). They had their headquarters at Kingston from 1966-70 and then again in 1988 until (possibly) 1999.